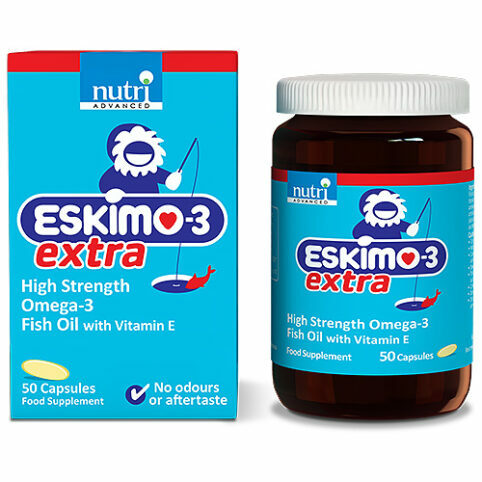 • Eskimo 3 Extra is a high potency fish oil supplement containing the important omega-3 fatty acids EPA and DHA in their optimal concentration, a 3:2 ratio. • Omega-3 fatty acids have been well studied for their role in the support of many systems in the body, including heart, musculoskeletal, cognitive and skin health. • Eskimo 3 Extra is an anti-inflammatory. • Enriched with a patented, scientifically evaluated antioxidant mixture, Pufanox®, which is very important for maintaining the stability of the fish oil and for preventing rancidity. • Produced from oily fish living in the deep seas. It is produced according to pharmaceutical standards and has a guaranteed high quality and is free from hexanes. • Eskimo fish oils are purified to remove any environmental contaminants such as mercury, and pesticides such as PCBs and DDT. 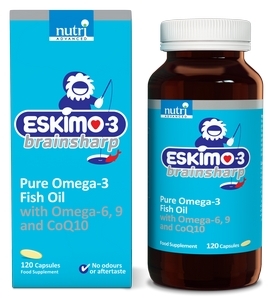 • Eskimo fish oils have been shown to be outstandingly pure and stable in several independent studies, making them exceptionally safe and effective.